Listen to the podcast. Or read a full transcript. The latest BriefingsDirect SOA Insights Edition, Vol. 27, provides a roundtable discussion and dissection of Services Oriented Architecture (SOA)-related news and events with a panel of IT analysts and experts. Please join noted IT industry analysts and experts Jim Kobielus, principal analyst at Current Analysis; Neil Macehiter, principal analyst at Macehiter Ward-Dutton; and Joe McKendrick, an independent analyst and blogger, for our most recent discussion, which is hosted and moderated by myself, Dana Gardner. 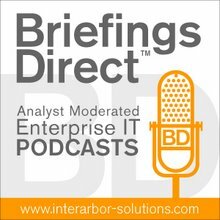 In this episode, recorded Oct. 26, our group examines the recent Microsoft SOA & Business Process Conference. The debate centers on whether the news around the pending Oslo approach amounts to support for SOA or Microsoft-Oriented Architecture (MOA) instead. Is this yet another elevation of the COM/DCOM wars, or is Microsoft moving to a federated modeling of business process value, one that may leapfrogs other SOA vendors products and methods? Or, perhaps Microsoft is seeking to both steer SOA adopters to its platforms while also offering an inclusive business process modeling approach? Look for the answers in this discussion. What's more, the analysts also evaluate SOA's role in Green IT. Does SOA beget better energy and resources use, or does better energy conservation in IT inevitably grease the skids toward greater SOA adoption -- or both? Learn more about how ROI and Green IT align with SOA patterns and adoption. The SOA universe is heading toward a model-driven paradigm for distributed service development in orchestration, and that’s been clear for a several years now. What Microsoft has discussed this week at its SOA and BPM conference was nothing radically new for the industry or for Microsoft. Over time, with Visual Studio and the .NET environment, they've been increasingly moving toward a more purely visual paradigm. Looking at the news this week from Microsoft on the so-called Oslo initiative, they are going to be enhancing a variety of their Visual Studio, BizTalk Server, BizTalk Services, and Microsoft System Center, bringing together the various metadata repositories underlying those products to enable a greater model-driven approach to distributed development. I was thinking, okay, that’s great, Microsoft, I have no problem with your model-driven approach. You're two, three, or four years behind the curve in terms of getting religion. That’s okay. It’s still taking a while for the industry to completely mobilize around this. ... So, it really is a Microsoft Oriented Architecture. They're building proprietary interfaces. I thought they were pretty much behind open standards. Now, unless it’s actually 2003, I have to go and check my calendar. I don’t see this as exclusively Microsoft-oriented, by any stretch. ... There are a couple of elements to the strategy that Microsoft’s outlined that differentiate it from the model-driven approaches of the past. The first is that they are actually encompassing management into this modeling framework, and they're planning to support some standards around things like the Service Modeling Language (SML), which will allow the transition from development through to operations. So, this is actually about the model-driven life cycle. A few years ago, they were talking about using domain specific language (DSL), which underpin elements of Visual Studio that currently exist, as a way of supporting different modeling paradigms. What we will see is the resurgence of DSL as a means of enabling different modeling approaches to be applied here. ... Microsoft is really trying to drive this is around a repository for models, for an SML model or for the models developed in Visual Studio. This smacks of being a very ambitious strategy from Microsoft, which is trying to pull together threads from different elements of the overall IT environment. You've got elements of infrastructure as a service, with things like the BizTalk Services, which has been the domain of large Web platforms. You've got this notion of computer applications in BPM which is something people like IBM, BEA, Software AG, etc. have been promoting. Microsoft has got a broad vision. We also mustn’t forget that what underpins this is the vision to have this execution framework for models. The models will actually be executed within the .NET framework in the future iteration. That will be based on the Window’s Communication Foundation, which itself sits on top of the WS-* standards ... . So that ambitious vision it still some way off, as you mentioned -- beta in 2008, production in 2009. Microsoft is going to have to bring its ISVs and systems integrator community along to really turn this from being an architecture that's oriented toward Microsoft to something broader. Clearly, they had to go beyond UML in terms of a modeling language, as you said, because UML doesn’t have the constructs to do deployment and management of distributed services and so forth. I understand that. What disturbs me right now about what Microsoft is doing is that if you look at the last few years, Microsoft has gotten a lot better when they are ahead of standards. When they're innovating in advance of any standards, they have done a better job of catalyzing a community of partners to build public specs. ... I'd like to see it do the same thing now in the realm of modeling. Green IT was named number one in a top-ten strategic technology areas for 2008 by Gartner Group. How does SOA impact this? The whole notion of SOA is based on abstraction, service contracts, and decoupling of the external calling interfaces from the internal implementations of various services. Green smashes through that entire paradigm, because Green is about as concrete as you get. SOA is the whole notion of consolidation -- consolidation of application logic, consolidation of servers, and consolidation of datacenters. In other words, it essentially reduces the physical footprint of the services and applications that we deploy out to the mesh or the fabric. Over time, if SOA is successful other centers of development or other deployed instances of code that do similar things will be decommissioned to enable maximum reuse of the best-of-breed order-processing technology that’s out there. As enterprises realize the ROI, the reuse and sharing should naturally lead to greater consolidation at all levels, including in the datacenter. Basically, reducing the footprint of SOA on the physical environment is what consolidation is all about. Another trend in the market is the SaaS approach, where we might acquire more types of services, perhaps on a granular level or wholesale level from Google, Salesforce, Amazon, or Microsoft, in which case they are running their datacenters. We have to assume, because they're on a subscription basis for their economics, that they are going to be highly motivated toward high-utilization, high-efficiency, low-footprint, low-energy consumption. That will ultimately help the planet, as well, because we wouldn’t have umpteen datacenters in every single company of more than a 150 people. Maybe we're looking at this the wrong way. Maybe we’ve got it backwards. Maybe SOA, in some way, aids and abets Green activities. Maybe it's Green activities, as they consolidate, unify, seek high utilization, and storage that aid and abet SOA. ... Green initiatives are going to direct companies in the way that they deploy and use technology toward a situation where they can better avail themselves of SOA principles. The issue is not so much reducing IT’s footprint on the environment. It’s reducing our species' overall footprint on the resources. One thing to consider is whether we have more energy-efficient datacenters. Another thing to consider is that, as more functionality gets pushed out to the periphery in terms of PCs and departmental servers, the vast majority of the IT is completely outside the [enterprise] datacenter. I'm going to be a cynic and am just going to guess that large, Global 2000 corporations are going to be motivated more by economics than altruism when it comes to the environment. ... As we discussed earlier, the Green approach to IT might actually augment SOA, because I don’t think SOA leads to Green, but many of the things you do for Green will help people recognize higher value from SOA types of activities.